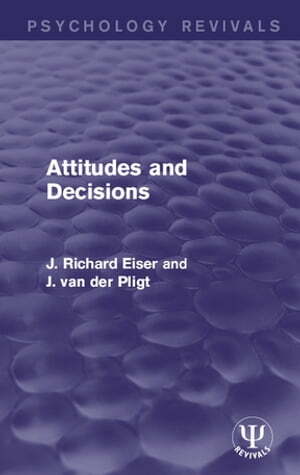 Collins Booksellers - Attitudes and Decisions by J Richard Eiser & Joop van der Pligt, 9781317360469. Buy this book online. The concept of attitude has long been a central part of social psychological theories. It is important in other disciplines too, such as economics, business studies, politics and sociology. Originally published in 1988, the authors of this text show how attitudes and motives are crucial in human decision-making, and explore the relationship between them. They look closely at the real context of people’s attitudes and behaviour, pointing out that attitudes are both a social product and an intrinsic part of social action. The authors show that theories of judgment, attitudes, attribution and decision-making can make important contributions to social issues such as the employment of nuclear energy, the storage of nuclear waste, health behaviour and medical decision-making. They emphasize that social psychology is relevant to a wide variety of social issues, deriving from the theoretical and distinctive methods that social psychology has developed.